Jay C. Wemple was Jay Cady Wemple (1827-1887). His entry in The New York Genealogical and Biographical Record, vol. XLIV, 1913, p. 275, reads, "Jay Cady Wemple, b. April 11, 1827; d. Sept. 7, 1887; m. June 30, 1852, Rachel Jane Nevins; founder of the Jay C. Wemple Shade Co., of New York and Chicago." J. C. Wemple were listed in 1901 as a firm in New York City in existence fifty years or more. (The list appeared in the New York Times Sept. 18, 1901, p. JS31.) But their first listing in the New York city directories was in 1859 as "Jay C. Wemple Co., window shades and rollers" 58 Catharine St. (now spelled Catherine). They moved several times in New York: 460 and 444-446 Pearl St. (1862-85), 537-39 Broadway (2d door North of Spring St.) (1885-1901), and 35 E. 20 St. (salesroom) (1901-17). This listing and accompanying ad appeared in Lain's Brooklyn Directory, 1882, when Wemple were located at 444-446 Pearl St. in New York and on 4th Ave. in Brooklyn. An earlier ad in Trow's New York City Directory, 1876, shows the Pearl St. address with an Avenue A location. The Biggert Collection of Architectural Vignettes at Columbia University contains a Jay C. Wemple & Co bill or receipt dated 3 July 1878. Their address is given as 444 & 446 Pearl Street. Wemple was described in New York's Great Industries, 1884, edited by Richard Edwards: "Jay C. Wemple & Co., Manufacturers of Window-Shades and Shadings, and Importers of Hollands, Nos. 537 and 539 Broadway, Factory at Baltic Street and Fourth Avenue, Brooklyn. - ... The business was established fifty years ago in Catherine Street, being permanently located in Pearl Street for twenty-five years. ... In March, 1884, the firm finally removed to their present very eligible premises in the fine building Nos. 537 and 539 Broadway. 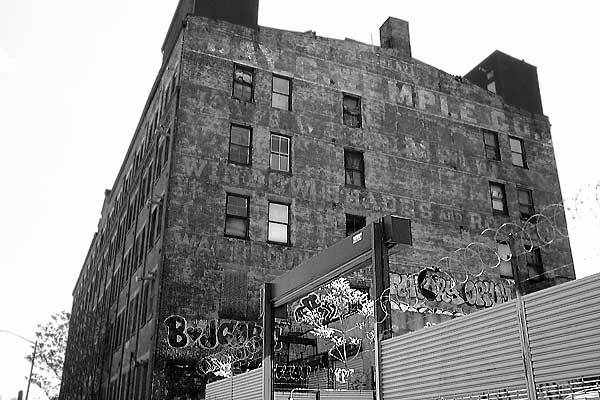 Here they occupy seven floors, the two upper floors being used for finishing, the dimensions of same being 40 x 200 feet, and which extend directly through from Broadway to Mercer Street... Their factory is situated in the four-story building at the corner of Fourth Avenue and Baltic Street, in Brooklyn... They manufacture every description of plain and ornamental window shades from the best of hollands and other materials ... in a full line of fast oil colors for store windows... They admittedly do the largest business of the kind in the world. The co-partners are Mr. Jay C. Wemple and Mr. D. C. Connell. The Spring Roller Shade Fixture. - With characteristic enterprise the firm of John C. Wemple & Co. have begun the manufacture of spring roller shade fixtures. These goods are made both of wood and tin." Their Brooklyn factory was located at 121 4th Ave. (corner of Baltic) from 1877 to 1892. The building above was their second Brooklyn factory (1892-1917) located at the corner of 32nd St. and 4th Ave. in the Sunset Park industrial area. This advertisement for the Jay C. Wemple Company appeared in Dry Goods Guide, vol. 33, no. 1, January, 1914.